Where do I start? When Jessica Backhaus showed me her new series Shifting Clouds, I was seduced right away by the beauty of the images and the coherence of the whole. She proposed that I write a text on this subject and it took me mere moments to decide. It was a challenge for me, a person who has maintained for years (wrongly, no doubt) that beauty is aware of itself but does not self-analyze. 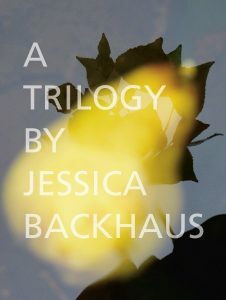 The consequence of this presupposition is that I write mainly on works that are a lot more “documentary” (the quote marks are indispensable here) than Jessica’s work is. Without doubt, Shifting Clouds, like the whole of her oeuvre, ought to convince us to leave this term to gather dust on the shelves of photography criticism. All photography is documentary, from the folded papers of Backhaus, to war photography, via the chemigrams of Pierre Cordier. Every photo has something real for a referent: a scrunched-up piece of paper, a battle, or a chemical reaction. The determining aspect, for me, of Jessica Backhaus’s work, and of Shifting Clouds in particular, is decontextualization. 99% of photos have a context. To take two Parisian examples, Dovima with Elephants by Richard Avedon has the Winter Circus and Harper’s Bazaar as its context; The Kiss by Robert Doisneau, the square outside City Hall, Paris of the 1950s. Publicity pack shots, one could object, elude context. But in fact, they do not: they are conditioned by their period of production and by brand placement, mass market, or elitist product, for example. Two more motifs, equally essential, are characteristic of Shifting Clouds: the fold, recognized by Gilles Deleuze as being central to the philosophy of Leibniz, and the run-out. The one doubtless being the antithesis of the other. Jessica Backhaus soaks scraps of paper in watercolor and then observes the interaction of the paper, pigments, and water. In these two elements it is necessary to see, it seems to me, a desire to testify to complexity. The fold corresponds to stacking: of knowledge, of codes, of the multiple elements that shape our lives, and the run-out to the simultaneous porosity of these same elements. Decontextualization is revealed as a tool that allows Jessica Backhaus to “document”, to bring into play, through the minimalist use of three simple figures—the circle, the fold, and the run-out—concepts that traverse art history: perfection, accumulation, and dispersion.